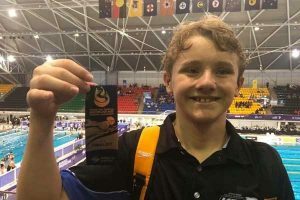 Congratulations to Daniel McLoughlin in Year 8 who recently competed in the 2018 Georgina Hope Foundation Age Swimming Nationals in Sydney. Daniel qualified for 3 events: 100 butterfly, 200 butterfly and 800 freestyle. He had 3 great swims, with 3 personal bests. An outstanding result for his first National appearance.